Our collection of Andrew Luck Fantasy Football Names is just what the Commish ordered if you have the Indianapolis Colts QB on your team. Luck, who played college ball at Stanford University, was a two-time All American and won the Maxwell Award as the best collegiate football player. In his first three seasons with the Colts, he led the team to the playoffs. A great passer, Luck can also hold his own when he’s called on to run the ball. 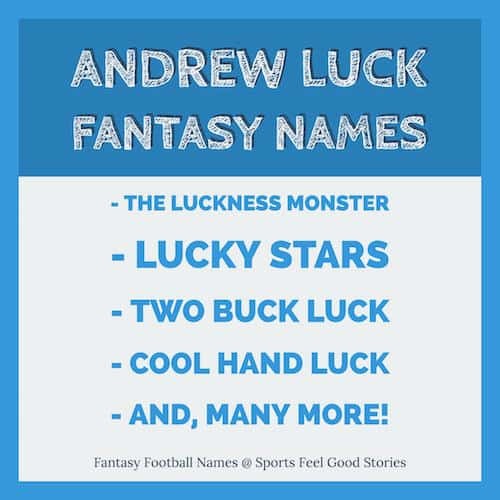 Check out these Andrew Luck Fantasy Football Team Names. What prime time TV show did Andrew Luck appear in? In the sixth season of Parks and Recreation (a great show! ), Luck appeared as himself. The show is set in Indiana, so that helped earn him the role. We’d rather be Luck-y than good. Luck resides @ Ty Hilton. • Luck’s favorite musician is Bruce Springsteen. No word yet if Luck hums “Tramps like us, baby we were born to run” when he takes off from the pocket. • Luck is a big reader and is known as the Colts’ librarian, frequently gifting books to teammates. • Luck has the habit of congratulating opposing players after good plays even if it involves Luck getting tackled. His polite approach to the game earns him high sportsmanship marks. • Papillon is his favorite book.